White fronted capuchin monkeys have a pinkish face that is surrounded white and a brown, yellow or reddish fur. The hair on their head is reminding of the hats of the Capuchin monks, that’s where they’ve got their name from. They body is gracefully built, they are nimble and are excellent climbers. They are living in groups of 5- 30 animals in large territories. 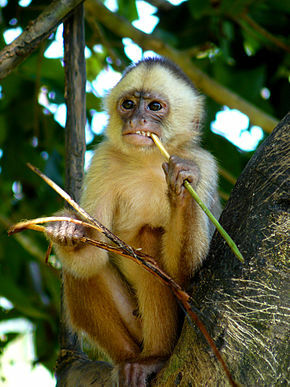 White-fronted capuchin monkeys are often joining groups of squirrel monkeys. They are searching all levels of the forest for food (fruit, seeds, and articulate animals) even the ground.